Good evening lovely nail art lovers! I am TREMENDOUSLY happy to say that I am one of the lucky winners of an AMAZING giveaways that Ejiubas ran for the last Black Friday. I was really happy to get to win something but after seeing what these guys sent me I feel even luckier. This 'Nail Mail' is from far THE best and most generous I have ever got! Look at how wonderful it is! The package contained a beautiful silicone nail art mat which came in its cute little bag. Then there is this amazing pouch full of high quality nail art brushes as well as those cute silicone brushes. It also come with tweezers and scissors. On top of all that, they even included two STUNNING stamping plates along with a set of nail vinyls! 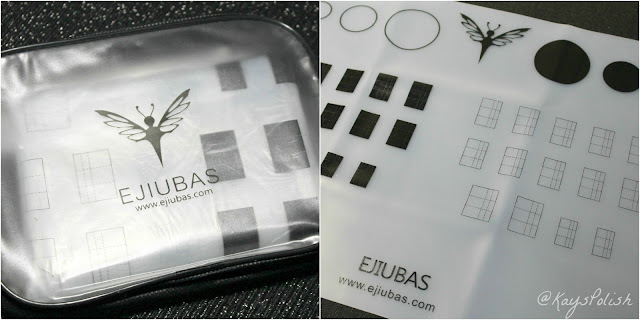 This little high quality pouch came with beautiful nail art brushes, tweezers, small scissors as well as a stamper and a scraper, all marked with ''Ejiubas''. Those are the two GORGEOUS sets of fake nails that are just perfect for someone who doesn't have long nails but want to have them for a special occasion. Here it the silicone mat that is perfect no to stain your nail art table. I also love the fact that it has black and transparent spaces as well as a space to calculate the length. I think its little pouch is just so cute and perfect to protect your mat whenever you want to bring it with you. 1, 2, 3, 4.... NO! 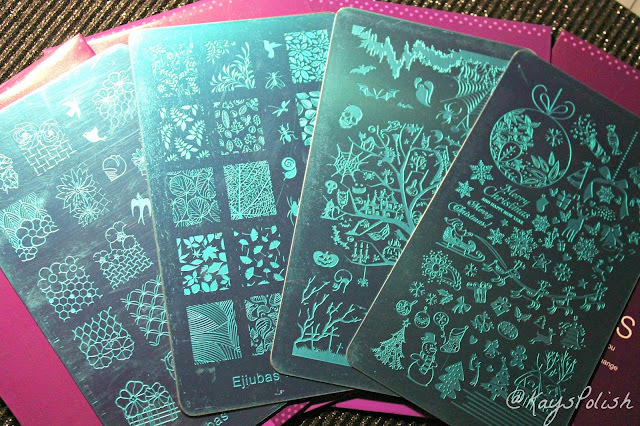 There are actually 8 BEAUTIFUL stamping plates here because those plates are all double-sided! There is one flower-themed, one plants and leaves-themed one for Halloween and one for Christmas. It is truly everything you need! Thy are huge and all have tons of gorgeous designs. 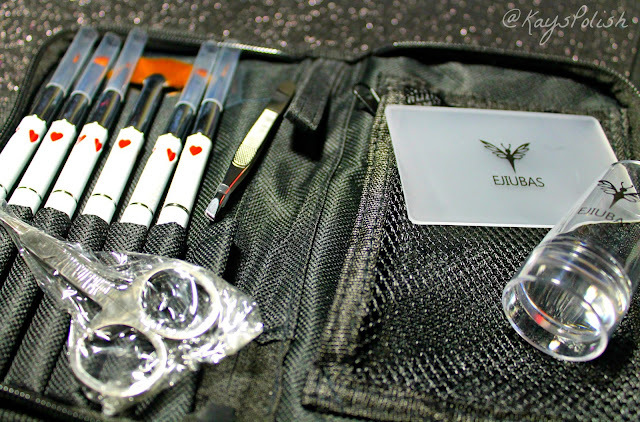 Beautiful set of double-sided nail art tools. On one side, you have all sorts of different silicone brushes, which is perfect because I was just about to buy some. Then, on the other side, you have different sizes of dotting tools. 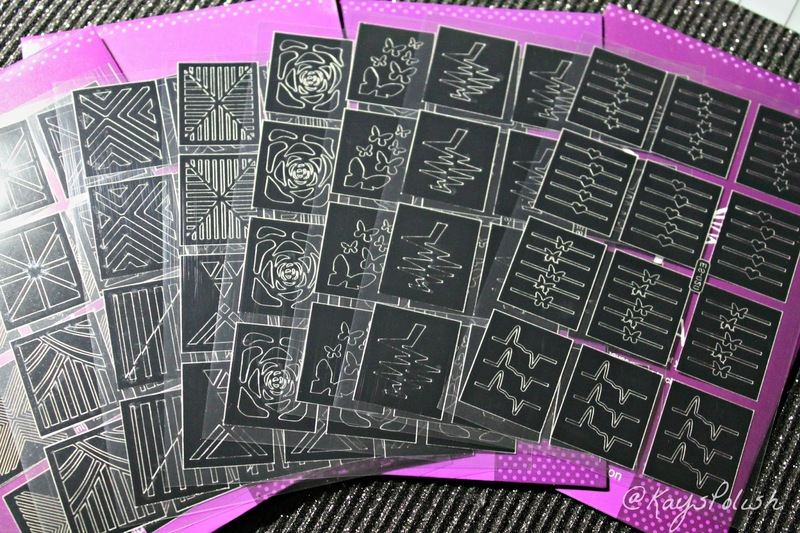 That is only half of the nail vinyls which came in the package. They all came with different patterns and I am specifically happy for that because I have never tried using vinyls so far so guess who's going to have fun during the holidays? I am truly excited about trying out all there AMAZING goodies and I will keep you posted with my review of them all!